This is a great recipe using the different healthier flours that are on the market today. The two I use most are spelt flour and brown rice flour and was able to substitute both for the refined white flour that usually is used for baking. Spelt flour is a great, much easier to digest, alternative to white or whole wheat flour. 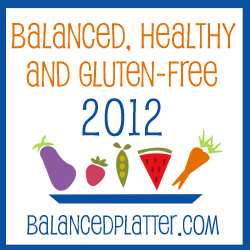 Many people with wheat allergies or intolerance's find they tolerate spelt flour well. Its an excellent source of vitamins and minerals,and makes great tasty baked goods. Breads don't rise as high, but the taste out ways that by far! Preheat oven to 350. Whisk together the flours, salt, baking soda and spices. In a separate medium bowl mix the pumpkin, eggs and vanilla, then add the club soda. Mix the dry ingredients into the wet 1/2 at a time, stir until just mixed, then add nuts. Pour into a bread pan and add topping. Mix and sprinkle on top of bread. Bake 50-60 minutes (check with a toothpick for doneness) cool in pan for 5 minutes, then remove from pan and cool on cooling rack. Pumpkin bread is one of the recipes still on my list to convert to gluten free. Thanks for the heads up with the spelt flour! This is a great, simple bread recipe. Spelt flour is one of my favorites to bake with! What a delicious quickbread. I really have to try that !